Association of Serbian Chetniks "Petar Mrkonjić"
The Chetnik Detachments of the Yugoslav Army, commonly known as the Chetniks (Serbo-Croatian: Četnici, Четници, pronounced [tʃɛ̂tniːtsi]; Slovene: Četniki), was a World War II movement in Yugoslavia led by Draža Mihailović, an anti-Axis movement in their long-range goals and engaged in marginal resistance activities for limited periods. They also engaged in tactical or selective collaboration with the occupying forces for almost all of the war. The Mihailović Chetniks were not a homogeneous movement. The Chetnik movement adopted a policy of collaboration with regard to the Axis, and engaged in cooperation to one degree or another by establishing modus vivendi or operating as "legalised" auxiliary forces under Axis control. Over a period of time, and in different parts of the country, the Chetnik movement was progressively drawn into collaboration agreements: first with the Nedić forces in the Territory of the Military Commander in Serbia, then with the Italians in occupied Dalmatia and Montenegro, with some of the Ustaše forces in northern Bosnia, and after the Italian capitulation also with the Germans directly. While Chetnik collaboration reached "extensive and systematic" proportions, the Chetniks themselves referred to their policy of collaboration as "using the enemy". Professor Sabrina Ramet, a historian, has observed, "Both the Chetniks' political program and the extent of their collaboration have been amply, even voluminously, documented; it is more than a bit disappointing, thus, that people can still be found who believe that the Chetniks were doing anything besides attempting to realize a vision of an ethnically homogeneous Greater Serbian state, which they intended to advance, in the short run, by a policy of collaboration with the Axis forces. Chetniks collaborated extensively and systematically with the Italian occupation forces until the Italian capitulation in September 1943, and beginning in 1944, portions of the Chetnik movement of Draža Mihailović collaborated openly with the Germans and Ustaša forces in Serbia and Croatia." However, David Bruce MacDonald posits that it is "highly misleading to suggest that [Chetniks] throughout the war collaborated with the Germans and Italians to carry out genocide of Croats and Moslems." The Chetniks were a partner in the pattern of terror and counter terror that developed in Yugoslavia during World War II. The Chetniks used terror tactics against the Croats in areas where Serbs and Croats were intermixed, against the Muslim population in Bosnia, Herzegovina and Sandžak, and against the Yugoslav Partisans and their supporters in all areas. These terror tactics took various forms, including killing of the civilian population, burning of villages, assassinations and destruction of property. Ethnic tensions existed between Croats and Serbs beforehand in the Kingdom of Yugoslavia. The terror tactics used by the Chetniks against the Croats were, to at least an extent, a reaction to the terror carried out by the Ustaše, but Croats and Bosniaks living in areas intended to be part of Greater Serbia were to be cleansed of non-Serbs regardless, in accordance with Mihailović's directive of 20 December 1941. The terror against the Partisans and their supporters was ideologically driven. The Muslim population of Bosnia, Herzegovina and Sandžak was a primary target of Chetnik terror due to the traditional animosity between Serbs and Muslims and also as countermeasures against Muslim 'aggressive' activities, but this action was also undertaken to 'cleanse' these areas of Muslims in order to create a 'Greater Serbia' free of non-Serbs. The organization was later renamed the Yugoslav Army in the Homeland (Jugoslovenska vojska u otadžbini, Југословенска војска у отаџбини; JVUO, ЈВУО), although the original name was more commonly used. The word "chetnik" was used to describe a member of a Balkan guerrilla force called cheta (чета, četa) which means "band or troop", itself derived from the Turkish word çete of the same meaning, which itself is derived from the Sanskrit word cakra meaning "a troop of soldiers". The suffix -nik is a Slavic personal suffix meaning "person or thing associated with or involved in". The Chetnik movement had its roots in the 19th-century Balkan liberation struggle against the Turks (Ottomans). The "Serbian Committee" had initially funded small groups of brigands, either self-organized or part of the Bulgarian revolutionary organizations active in Macedonia (SMAC and IMRO), that were used to protect the Christian population from Ottoman atrocities and persecution. With the failed negotiations of a continued joint Serbian-Bulgarian action, and growing nationalism within the Bulgarian committees, the Serbian Committee decided to fully organize their own armed groups. Soon, hostility between IMRO and the Serbian Chetnik Organization began. The Serbian government soon took over the activities of the organization. The Chetniks engaged the Ottomans, and Bulgarian and Albanian irregular bands, in the 1904–08 period. Activities were temporarily stopped after the Young Turk Revolution (1908). Following the end of World War I and the formation of the Kingdom of Serbs, Croats and Slovenes, pro-Bulgarian sentiment was rife in Macedonia, which was referred to as "Southern Serbia" by the Belgrade government. Extensive measures were undertaken to "serbianise" Macedonia, including closing Bulgarian Orthodox Church schools, revising history textbooks, dismissing "unreliable" teachers, banning the use of the Bulgarian language, and imposing lengthy jail terms for those convicted of anti-state activities. Hundreds of Bulgarian activists were murdered and thousands arrested in the period immediately following the war, and around 50,000 troops were stationed in Macedonia. Bands of Serbian Chetniks, including one led by Babunski, were organised to terrorise the population, kill pro-Bulgarian resistance leaders and recruit the local population into forced labour for the army. Resistance by IMRO was met with further terror, which included the formation in 1922 of the Association against Bulgarian Bandits led by Pećanac and Ilija Trifunović-Lune, based out of Štip in eastern Macedonia. This organisation quickly garnered a reputation for indiscriminate terrorisation of the Macedonian populace. Pećanac and his Chetniks were also active in fighting those resisting the Serb and Montenegrin "colonisation" of Kosovo. 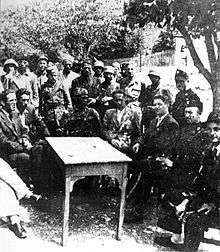 The Chetnik movement also functioned as a civilian organization during the interwar period, initially as the "Chetnik Association for the Freedom and Honor of the Fatherland" (Udruženje Četnika za slobodu i čast Otadžbine), a Chetnik veteran organisation formed in Belgrade in 1921. The aims of the organisation were to foster Chetnik history, spread Chetnik ideas, and to care for disabled Chetniks and the widows and orphans of fallen Chetniks. Initially the organisation was aligned with the Democratic Party, but the increasing influence of the Serbian Radical Party resulted in a split of the organisation in 1924. The pro-Radical Party, Greater Serbia elements of the organisation formed two new organisations; the "Association of Serbian Chetniks for King and Fatherland" (Udruženje srpskih četnika za Kralja i Otadžbinu) led by Puniša Račić, and the "Association of Serbian Chetniks "Petar Mrkonjić"" (Udruženje srpskih četnika Petar Mrkonjić). Around a year later these two organisations amalgamated as the "Association of Serbian Chetniks "Petar Mrkonjić" for King and Fatherland" with Račić presiding over a great deal of dissension until 1928 when the organisation ceased to operate. 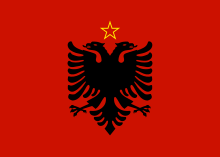 After the imposition of royal dictatorship by King Alexander in 1929, the "Petar Mrkonjić" association was dissolved, and the former dissidents re-joined the original "Chetnik Association for the Freedom and Honor of the Fatherland". Mihailović's group was also called the "Chetnik Detachments of the Yugoslav Army", although "The Ravna Gora Movement" was and still is used to refer to the Chetniks. The movement was later to be renamed the "Yugoslav Army in the Homeland", although the original name of the movement remained the most common in use throughout the war, even among the Chetniks themselves. It is these forces that are generally referred to as "the Chetniks" throughout World War II although the name was also used by other smaller groups including those of Pećanac, Nedić and Dimitrije Ljotić. In June 1941, following the start of Operation Barbarossa, the communist-led Partisans under Josip Broz Tito organised an uprising and in the period between June and November 1941, the Chetniks and Partisans largely cooperated in their anti-Axis activities. In the summer of 1941, the Ravna Gora Movement had attracted a small number of Serb intellectuals who developed a political ideology for the Chetniks. Stevan Moljević believed that Serbs should not repeat the mistakes of World War I by failing to define the borders of Serbia, and proposed that at the end of World War II Serbs should take control of all territories to which they laid claim, and from that position negotiate the form of a federally organized Yugoslavia. This plan required the relocation of non-Serbs from Serb-controlled territories and other shifts of populations. He produced a document, Homogenous Serbia, which articulated these notions. Moljević proposed that Greater Serbia consist of 65–70% of the total Yugoslav territory and population. He based his plan on the expulsion of the non-Serb population in different areas and on population exchanges, but did not provide any figures. Mihailović appointed Moljević to the Central National Committee of the Chetnik movement in August 1941. Moljević's proposals were very similar to those later formulated by the Belgrade Chetnik Committee and presented to the Government in Exile in September 1941, in which the Chetniks set forth specific figures in regard to population shifts. Some Chetnik leaders initially conducted a number of operations against Axis forces jointly with the Partisans. On 19 September 1941, Tito and Mihailović met for the first time in Struganik where Tito offered Mihailović the chief-of-staff post in return for the merger of their units. Mihailović refused to attack the Germans, fearing reprisals, but promised to not attack the Partisans. According to Mihailović the reason was humanitarian: the prevention of German reprisals against Serbs at the published rate of 100 civilians for every German soldier killed, 50 civilians for every soldier wounded. On 20 October, Tito proposed a 12-point program to Mihailović as the basis of cooperation. Six days later, Tito and Mihailović met at Mihailović's headquarters where Mihailović rejected principal points of Tito's proposal including the establishment of common headquarters, joint military actions against the Germans and quisling formations, establishment of a combined staff for the supply of troops, and the formation of national liberation committees. In late October, Mihailović concluded the Partisans, rather than Axis forces, were the primary enemies of the Chetniks. On 2 November, Mihailović's Chetniks attacked Partisan headquarters in Užice. The attack was driven back and a counterattack followed the next day, the Chetniks lost 1,000 men in these two battles and a large amount of weaponry. 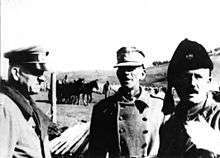 On 18 November, Mihailović accepted a truce offer from Tito though attempts to establish a common front failed. That month, the British government, upon the request of the Yugoslav government-in-exile, insisted Tito make Mihailović the commander-in-chief of resistance forces in Yugoslavia, a demand he refused. Partisan-Chetnik truces were repeatedly violated by the Chetniks, first with the killing of a local Partisan commander in October and then later, under orders of Mihailović's staff, massacring 30 Partisan supporters, mostly girls and wounded individuals, in November. Despite this, Chetniks and Partisans in eastern Bosnia continued to cooperate for some time. In December 1941 the Yugoslav government-in-exile in London under King Peter II promoted Mihailović to Brigadier-General and named him commander of the Yugoslav Home Army. By this time Mihailović had established friendly relations with Nedić and his Government of National Salvation and the Germans who he requested weaponry from to fight the Partisans. This was rejected by General Franz Böhme who stated they could deal with the Partisans themselves and demanded Mihailović's surrender. The Germans launched an attack on Mihailović's forces in Ravna Gora and effectively routed the Chetniks from the Territory of the Military Commander in Serbia. The bulk of the Chetnik forces retreated into eastern Bosnia and Sandžak and the centre of Chetnik activity moved to the Independent State of Croatia (NDH), a Nazi puppet state. The British liaison to Mihailović advised Allied command to stop supplying the Chetniks after their attacks on the Partisans in the German attack on Užice, but Britain continued to do so. Later during the war, the Allies were seriously considering an invasion of the Balkans, so the Yugoslav resistance movements increased in strategic importance, and there was a need to determine which of the two factions was fighting the Germans. A number of Special Operations Executive (SOE) agents were sent to Yugoslavia to determine the facts on the ground. In the meantime, the Germans, also aware of the growing importance of Yugoslavia, decided to wipe out the Partisans with determined offensives. The Chetniks, by this time, had agreed to provide support for the German operations, and were in turn granted supplies and munitions to increase their effectiveness. The Chetniks were almost exclusively made up of Serbs  and consisted of "local defence units, marauding bands of Serb villagers, anti-partisan auxiliaries, forcibly mobilised peasants, and armed refugees". The vast majority of Orthodox priests supported the Chetniks with some, notably Momčilo Đujić and Savo Božić, becoming commanders. A few Croats in central Dalmatia and Primorje supported Mihailović, but the group was too small to have any political or military significance. A few Sandžak and Bosnian Muslims also supported him. In Slovenia, Major Karlo Novak led a small pro-Mihailović group which never played an important role. A number of Jews joined the Chetniks, but later defected to the Partisans. Chetniks treated women with the norm prevalent in the Balkans at the time, limiting their duties to those traditionally performed. In November 1941, Major Karlo Novak, who had initially been appointed as the chief of staff of the Slovene Chetniks, became their commander when Mihailović's original delegate, Colonel Jakob Avšić defected to the Partisans. In Slovenia, anti-Communist resistance was dominated by the Slovene Alliance led by the Slovene People's Party rather than the Chetniks, and although the Slovene Alliance theoretically owed allegiance to the government-in-exile via Mihailović as Chief of Staff of the Yugoslav Army in the Homeland, in reality it was completely independent of his command. 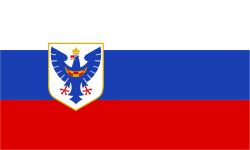 The Slovene Alliance collaborated with the Italians, becoming 'legalised' as units of the MVAC. Partly as a result of the dominance and influence of the Slovene Alliance, Novak was unable to attract a significant following, and at their peak the Slovene Chetniks numbered no more than 300–400 fighters. Novak received some arms and ammunition indirectly from the Italians. In September 1943 at the village of Grčarice, 50 km southeast of Ljubljana, the main Slovene Chetnik force of about 200 fighters was wiped out by the Partisans. Novak escaped to Italy where he remained for the remainder of the war. In mid-1944, Colonel (later General) Ivan Prezelj, who had been appointed as Mihailović's delegate in Slovenia after Novak's escape to Italy, briefly re-established several Slovene Chetnik detachments. One of these, operating in Lower Styria and led by Jože Melaher, managed to survive until the end of the war. Initially many Jews served in the Chetniks, a number of whom were former prisoners of concentration camps, and a Jewish Patriotic Brigade existed. A Jew served as Mihailović's aide-de-camp and they had their own newspaper named Židov. Jews were among the Chetniks during the first months of occupied Yugoslavia, but as Chetnik resistance ceased and collaboration increased the Chetniks searched for Jews in hiding and murdered them after torture or handed them over to the Germans. Jews left the Chetniks in favor of the Partisans and on 2 January 1943 a directive from Mihailović stated: "Partisan units are a motley collection of rascals, such as the Ustašas, the most blood-thirsty enemies of the Serbian people, Jews, Croats, Dalmatians, Bulgarians, Turks, Hungarians, and all other nations of the world." Chetnik policies barred women from performing significant roles. No women took part in fighting units and were restricted to nursing and occasional intelligence work. The low status of female peasants in areas of Yugoslavia where Chetniks were strongest could have been utilized and advantageous in military, political, and psychological terms. The treatment of women was a fundamental difference between the Chetniks and Partisans and Chetnik propaganda disparaged the female role in the Partisans. To support the Chetniks sufficiently to make them fight against the communists, but not so much as to allow them too much latitude in their own action; to demand and assure that the Chetniks do not fight against the Croatian forces and authorities; to allow them to fight against the communists on their own initiative (so that they can "slaughter each other"); and finally to allow them to fight in parallel with the Italian and German forces, as do the nationalist bands [Chetniks and separatist Zelenaši] in Montenegro. — Major Mirko Blaž, 5 March 1944. Hungary also tried to contact Mihailović through the royal Yugoslav government's representative in Istanbul in order to cooperate against the Partisans. The Yugoslav Minister of Foreign Affairs, Momčilo Ninčić, reportedly sent a message to Istanbul asking the Hungarians to send an envoy and a Serb politician from the Hungarian-occupied territories to negotiate. Nothing came of these contacts, but Mihailović sent a representative, Čedomir Bosnjaković, to Budapest. For their part the Hungarians sent arms, medicine and released Serbian POWs willing to serve with the Chetniks down the Danube. Chetnik ideology revolved around the notion of a Greater Serbia within the borders of Yugoslavia, to be created out of all territories in which Serbs were found, even if the numbers were small. This goal had long been the foundation of the movement for a Greater Serbia. During Axis occupation the notion of clearing or "ethnically cleansing" these territories was introduced largely in response to the massacres of Serbs by the Ustaše in the Independent State of Croatia. However, the largest Chetnik massacres took place in eastern Bosnia where they preceded any significant Ustaša operations. The Chetniks systemically massacred Muslims in villages that they captured. In late autumn of 1941 the Italians handed over the towns of Višegrad, Goražde, Foča and the surrounding areas, in south-east Bosnia to the Chetniks to run as a puppet administration and NDH forces were compelled by the Italians to withdraw from there. After the Chetniks gained control of Goražde on 29 November 1941, they began a massacre of Home Guard prisoners and NDH officials that became a systematic massacre of the local Muslim civilian population. Several hundred Muslims were murdered and their bodies were left hanging in the town or thrown into the Drina river. On 5 December 1941, the Chetniks received the town of Foča from the Italians and proceeded to massacre around five hundred Muslims. Additional massacres against the Muslims in the area of Foča took place in August 1942. In total, over two thousand people were killed in Foča. Actions against Croats were smaller in scale but similar in action. In the summer of 1941, Trubar, Bosansko Grahovo and Krnjeuša were the sites of the first massacres and other attacks against ethnic Croats in the southwestern Bosnian Krajina. A German national, Waldemar Maximilian Nestor, was the first Roman Catholic priest killed in World War II in Yugoslavia. In early October 1942 in the village of Gata near Split, an estimated one hundred people were killed and many homes burnt purportedly as reprisal for the destruction of some roads in the area and carried out on the Italians' account. In that same October, formations under the command of Petar Baćović and Dobroslav Jevđević, who were participating in the Italian Operation Alfa in the area of Prozor, massacred over five hundred Croats and Muslims and burnt numerous villages. Baćović noted that "Our Chetniks killed all men 15 years of age or older. ... Seventeen villages were burned to the ground." Mario Roatta, commander of the Italian Second Army, objected to these "massive slaughters" of noncombatant civilians and threatened to halt Italian aid to the Chetniks if they did not end. All in all, intelligence reports resulted in increased Allied interest in Yugoslavia air operations, and a shift in policy. In September 1943, British policy dictated equal aid to the Chetniks and Partisans, but by December, relations between the Chetniks and British soured after Chetniks refused to obey orders to sabotage the Germans without the guarantee Allied landing in the Balkans. Over time British support moved away from the Chetniks, which refused to stop collaborating with the Italians and Germans to fight them, towards the Partisans, which were eager to increase their anti-Axis activity. The commander of a group of the Shock Corps, Lt. Col. Keserović, was the first Chetnik officer to cooperate with the Soviets. In mid-October his troops met Soviet forces advancing into central eastern Serbia from Bulgaria and together they occupied the town of Kruševac, the Soviets leaving Keserović in charge of the town. Within three days, Keserović was warning his fellow commanders that the Russians were only talking with the Partisans and disarming the Chetniks. Keserović reported to Supreme Command on 19 October that his delegate to the Soviet division had returned with a message ordering his men to be disarmed and incorporated in the Partisan armed forces by 18 October. In 1975, Nikola Kavaja, a diaspora Chetnik living in Chicago and belonging to the Serbian National Defense Council (SNDC), was, at his own initiative, responsible for bombing a Yugoslav consul's home, the first in a series of attacks targeting the Yugoslav state in the United States and Canada. He and his co-conspirators were captured in a sting set up by the Federal Bureau of Investigation and convicted for terrorism for the incident and for planning to bomb two Yugoslav receptions on Yugoslavia's National Day. Later that year, during his flight to receive his sentence, he hijacked the American Airlines Flight 293 with the intention of crashing the plane into Tito's Belgrade headquarters, but was dissuaded; he ultimately received a 67-year prison sentence. After Serbian President Slobodan Milošević's assumption of power in 1989 various Chetnik groups made a "comeback" and his regime "made a decisive contribution to launching the Chetnik insurrection in 1990–1992 and to funding it thereafter". Chetnik ideology was influenced by the memorandum of the Serbian Academy of Sciences and Arts. On 28 June 1989, the 600th anniversary of the Battle of Kosovo, Serbs in north Dalmatia, Knin, Obrovac, and Benkovac where there were "old Chetnik strongholds", held the first anti-Croatian government demonstrations. On the same day, Đujić declared Vojislav Šešelj "at once assumes the role of a vojvoda and a vladika [high-ranking religious order] unifier" and ordered him "to expel all Croats, Albanians, and other foreign elements from holy Serbian soil", stating he would return only when Serbia was cleansed of "the last Jew, Albanian, and Croat". The Serbian Orthodox Church began the procession of the reliquary of Prince Lazar, who participated in the Battle of Kosovo and was canonized, and in the summer it reached the Zvornik-Tuzla eparchy in Bosnia and Herzegovina where there was a feeling of "historic tragedy of the Serb people, which is experiencing a new Kosovo" accompanied by nationalist declarations and Chetnik iconography. During the Yugoslav Wars, many Serb paramilitaries styled themselves as Chetniks. The SRS's military wing was known as "Chetniks" and received weaponry from the Yugoslav People's Army (JNA) and Serbian police. Šešelj personally helped arm Serbs in Croatia and recruited volunteers in Serbia and Montenegro, sending 5,000 men to Croatia and up to 30.000 to Bosnia and Herzegovina. According to Šešelj "the Chetniks never acted outside the umbrella of the Yugoslav People's Army and the Serbian police". Željko Ražnatović, a self-styled Chetnik, led a Chetnik force called the Serb Volunteer Guard (SDG), established on 11 October 1990. The SDG was connected to the Serbian Ministry of Interior, operated under JNA command, and reported directly to Milošević. It had between 1,000 and 1,500 men. Jović, at the time the Serbian Minister of the Interior, organized the youth wing of the SNO into the White Eagles, a paramilitary closely based on the World War II Chetnik movement, and called for "a Christian, Orthodox Serbia with no Muslims and no unbelievers." It came to be associated with the SRS though Šešelj denied the connection. Later the SRS became a government coalition partner of Milosević and in 1998, Đujić publicly stated that he regretted awarding that title to Šešelj. He was quoted as saying, "I was naïve when I nominated Šešelj [as] Vojvoda; I ask my people to forgive me. The greatest gravedigger of Serbdom is Slobodan Milošević" and that he is "disappointed in Šešelj for openly collaborating with Milošević's Socialist Party, with Communists who have only changed their name. ... Šešelj has sullied the reputation of Chetniks and Serbian nationalism." In 2000, Ražnatović was killed before facing prosecution by the International Criminal Tribunal for the former Yugoslavia (ICTY). In 2003, Šešelj surrendered himself to the ICTY to face war crimes charges. In Serbia there has been a revival of Chetnik nationalism. Since the early 1990s, the SPO has annually held the "Ravna Gora Parliament" and in 2005 it was organized with state funding for the first time. Croatian president Stjepan Mesić later cancelled a planned visit to Serbia as it coincided with the gathering. People who attend the Parliament wear Chetnik iconography and T-shirts with the image of Mihailović or of Mladić, who is on trial at the ICTY on charges of genocide, crimes against humanity and war crimes. The SRS headed by Nikolić, still in favor of a Greater Serbia and rooted in the Chetnik movement, won the 2003 elections with 27.7 percent and gained 82 seats of the 250 available. In 2005, Patriarch Pavle of the Serbian Orthodox Church backed the SRS. It later won the 2007 elections with 28.7 percent of the vote. In 2008, Nikolić split with SRS over the issue of cooperation with the European Union and formed the Serbian Progressive Party. In March 2004, the National Assembly of Serbia passed a new law that equalized the Chetniks and Partisans as equivalent anti-fascists. The vote was 176 for, 24 against and 4 abstained. Vojislav Mihailović, the Vice President of the Serbian Parliament and grandson of Draža Mihailović, stated it was "late, but it provides satisfaction to a good portion of Serbia, their descendants. They will not get financial resources, but will have the satisfaction that their grandfathers, fathers, were true fighters for a free Serbia." Anti-fascist war veterans' associations criticized the law and stated that Serbia was "the first country in Europe to declare a quisling movement as being liberating and anti-fascist." In 2009, Serbian courts rehabilitated Chetnik ideologist Dragiša Vasić. In September 2012, the Constitutional Court of Serbia declared the 2004 law unconstitutional stating Chetnik veterans were not permitted an allowance and medical assistance while still maintaining their rights to a pension and rehabilitation. The Serbian basketball player Milan Gurović has a tattoo of Mihailović on his left arm which has resulted in a ban since 2004 in playing in Croatia where it is "considered an incitement ... of racial, national or religious hatred". Later Bosnia and Herzegovina and Turkey enacted such a ban. Serbian rock musician and poet Bora Đorđević, leader of the highly popular band Riblja Čorba, is also a self-declared Chetnik, but calling it a "national movement that is much older than the WWII", and adding that he does not hate other nations and never been a member of the SRS nor advocated Greater Serbia. The Association of War Veterans of the National Liberation Army (SUBNOR) objected to the construction of the monument saying that Đurišić was a war criminal who was responsible for the deaths of many colleagues of the veterans association and 7,000 Muslims. The association was also concerned about the organizations that backed the construction including the Serbian Orthodox Church and its militant Montenegrin wing which is led by Metropolitan Amfilohije. The Muslim Association of Montenegro condemned the construction and stated that "this is an attempt to rehabilitate him and it is a great insult to the children of the innocent victims and the Muslim people in Montenegro." On 4 July, the Montenegrin government forbade the unveiling of the monument stating that it "caused public concern, encouraged division among the citizens of Montenegro, and incited national and religious hatred and intolerance." A press release from the committee in charge of the construction of the monument stated that the actions taken by the government were "absolutely illegal and inappropriate". On 7 July, the stand that was prepared for the erection of the monument was removed by the police. 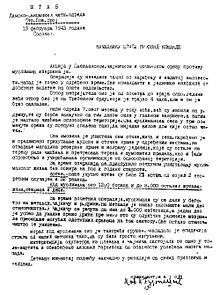 On 22 July 1996, the Republika Srpska entity of Bosnia and Herzegovina created a veteran rights law that explicitly covered former Chetniks, but did not specify the Partisans. During the Bosnian War, the main trafﬁc road in Brčko was renamed the "Boulevard of General Draža Mihailović" and on 8 September 1997 a statue of Mihailović was established in the town's center. In 2000, the street was renamed the "Boulevard of Peace" and in 2004, after lobbying by Bosniak returnees and intervention from the Office of the High Representative, the statue was moved to an Orthodox cemetery located at the outskirts of Brčko. It was removed on 20 October 2005 and on 18 August 2013 unveiled in Višegrad. In May 1998, the Chetnik Ravna Gora Movement of Republika Srpska was founded and proclaimed itself the military branch of the SDS and the SRS. 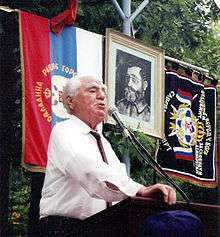 In April 1998, the "key date in its recent history" occurred when Šešelj had held a speech for a gathering in Brčko with representatives from the SDS, the SRS, the Serb National Alliance (SNS), the Assembly of Serb Sisters of Mother Jevrosima, the High Council of Chetnik Veterans of Republika Srpska, and the Chetnik Ravna Gora Movement of Serbia in attendance. In April 1999 it was legally registered and later renamed the Serb National Homeland Movement. Important individuals in its beginnings included: Karadžić, Mladić, Nikola Poplasen, Dragan Čavić, Mirko Banjac, Mirko Blagojević, Velibor Ostojić, Vojo Maksimović and Božidar Vučurević. It operates in fourteen regions where members work in "trojkas" and infiltrate various civilian organisations. On 5 May 2001, it disrupted cornerstone laying ceremonies for the destroyed Omer Pasha Mosque in Trebinje and on 7 May for the destroyed Ferhat Pasha Mosque in Banja Luka. The Bosnian magazine Dani linked to the Oslobođenje newspapers, claimed that the "international community" and the Organization for Security and Co-operation in Europe designated it a terrorist and pro-fascist organization. In 2005, United States president George W. Bush issued an executive order and its US assets were, among other organizations, frozen for obstructing the Dayton Agreement. On 12 July 2007, a day after the 12th anniversary of the Srebrenica Genocide and the burial of a further 465 victims, a group of men dressed in Chetnik uniforms marched the streets of Srebrenica. They all wore badges of military units which committed the massacre in July 1995. On 11 July 2009, after the burial of 543 victims in Srebrenica, members of the Ravna Gora Chetnik movement desecrated the flag of Bosnia and Herzegovina, marched in the streets wearing T-shirts with the face of Mladić and sang Chetnik songs. A group of men and women associated with the Serbian far-right group Obraz "chanted insults directed towards the victims and in support of the Chetnik movement, calling for eradication of Islam." A full report of the incident was submitted to the local District Prosecutor's Office but no one has been prosecuted. The Social Democratic Party of Bosnia and Herzegovina has been campaigning for a creation of a law that would ban the group within Bosnia. In March 2014, Serbian volunteers self-identifying as Chetniks travelled to Sevastopol in Crimea to support the pro-Russian side of the Crimean crisis. 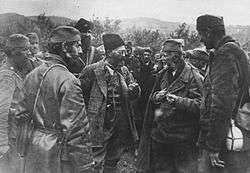 Chetnik forces are led by a Serb national and Chetnik, Bratislav Zivkovic. They spoke of "common Slavic blood and Orthodox faith", cited similarities with the Cossacks, and claimed to be returning the favour of Russian volunteers who fought on the Serbian side of the Yugoslav Wars. Chetnik fighters have also participated in the ongoing fighting in eastern Ukraine since its inception in early 2014. In August 2014, it was reported that Chetniks killed 23 Ukrainian soldiers and took out a "significant amount of armored vehicles" during clashes with the Ukrainian army. ↑ Milazzo 1975, pp. 103–05. ↑ Milazzo 1975, p. 182. ↑ Milazzo 1975, p. 140. ↑ Milazzo 1975, pp. 185–86. 1 2 3 4 Ramet 2006, p. 145. 1 2 3 4 5 6 Ramet 2006, p. 147. ↑ Tomasevich 1975, pp. 224–25. ↑ Macdonald 2002, pp. 140–42. ↑ Pavlowitch 2007, pp. 65–67. ↑ Milazzo 1975, pp. preface. ↑ Hehn 1971, p. 350; Pavlowitch 2002, p. 141, official name of the occupied territory. 1 2 Tomasevich 1975, p. 196. ↑ Tomasevich 1975, p. 246. ↑ Macdonald, David Bruce (2002). Balkan Holocausts? : Serbian and Croatian Victim Centered Propaganda and the War in Yugoslavia. Manchester University Press. p. 142. ISBN 978-0-7190-6467-8. ↑ Djokic, Dejan. "Coming To Terms With The Past: Former Yugoslavia." History Today 54.6 (2004): 17-19. History Reference Center. Web. 3 Mar. 2015. 1 2 Tomasevich 1975, p. 259. 1 2 Tomasevich 1975, pp. 256–261. ↑ Tomasevich, Jozo (1975). The Chetniks. p. 259. ↑ Tomasevich 1975, p. 125. ↑ Online Etymology Dictionary 2011a. ↑ Online Etymology Dictionary 2011b. 1 2 3 4 5 Roberts 1987, p. 21. ↑ Tomasevich 1975, p. 116. 1 2 3 4 5 Tomasevich 1975, p. 117. ↑ Tomasevich 1975, pp. 117–118. ↑ Mitrović 2007, pp. 248–259. ↑ Mitrović 2007, pp. 261–273. ↑ Hupchick 1995, p. 143. ↑ Ramet 2006, pp. 46–48. ↑ Tomasevich 1975, p. 118. 1 2 3 Tomasevich 1975, p. 119. ↑ Glas Javnosti 26 May 2003. ↑ Ramet 2006, p. 89. ↑ Singleton 1985, p. 188. ↑ Pavlowitch 2007, p. 52. ↑ Trbovich 2008, p. 133. ↑ Pavlowitch 2007, p. 54. ↑ Tomasevich 1975, p. 123. ↑ Roberts 1987, p. 67. ↑ Pavlowitch 2007, p. 64. ↑ Tomasevich 1975, p. 169. ↑ Judah 2000, pp. 121–122. ↑ Judah 2000, pp. 121–22. ↑ Tomasevich 1975, pp. 167–171. 1 2 Hoare 2006, p. 143. 1 2 3 Tomasevich 1975, p. 170. 1 2 3 4 Tomasevich 1975, p. 171. ↑ Pajović 1977, p. 42. ↑ Pavlowitch 2007, p. 112. ↑ Tomasevich 1975, p. 172. ↑ Tomasevich 1975, p. 174. ↑ Tomasevich 1975, p. 261. 1 2 Ramet 2006, p. 143. ↑ Bailey 1998, p. 80. ↑ Tomasevich 2001, p. 142. ↑ Ramet 2006, p. 144. 1 2 Ramet 2006, p. 152. ↑ Ramet 2006, pp. 144–45. ↑ Roberts 1987, pp. 34–35. ↑ Tomasevich 1975, p. 173–74. ↑ Milazzo 1975, p. 186. ↑ Tomasevich 1975, p. 177. ↑ Tomasevich 1975, p. 173–174. ↑ Tomasevich 1975, p. 158. 1 2 Cohen 1996, pp. 76–77. 1 2 3 Tomasevich 1969, p. 97. ↑ Tomasevich 2001, p. 492. 1 2 Velkonija 2003, p. 167. ↑ Tomasevich 1975, pp. 216–17. ↑ Tomasevich 2001, p. 494. ↑ Redžić 2005, pp. 145–146. ↑ Judah 2000, p. 122. ↑ Tomasevich 2001, p. 501. ↑ Tomasevich 1975, p. 222. ↑ Tomasevich 1975, p. 224. ↑ Tomasevich 1975, p. 225. ↑ Tomasevich 2001, p. 125. ↑ Shub 1943, pp. 110–11. ↑ Tomasevich 1975, pp. 187–188. 1 2 3 4 5 6 7 8 9 10 11 12 13 14 15 Tomasevich 1975, p. 226. 1 2 3 Cohen 1996, p. 40. ↑ Velkonija 2003, pp. 166–67. 1 2 Tomasevich 1975, p. 352. ↑ Redžić 2005, p. 141. ↑ Roberts 1987, p. 20. ↑ Roberts 1987, p. 26. ↑ Roberts 1987, p. 27. 1 2 Tomasevich 2001, p. 308. ↑ Röhr 1994, p. 358. ↑ Ramet 2006, pp. 133–135. ↑ Tomasevich 2001, p. 183. ↑ Tomasevich 2001, pp. 214–16. 1 2 3 Ramet 2006, pp. 133–35. ↑ Cohen 1996, p. 57. ↑ Macartney 1957, pp. 145-47. ↑ Macartney 1957, p. 180. ↑ Macartney 1957, p. 265. ↑ Macartney 1957, p. 355. ↑ Tomasevich 1975, p. 173. ↑ Tomasevich 1975, pp. 256–57. ↑ Pavlowitch 2007, pp. 47–49. ↑ Malcolm 1994, p. 175. ↑ Tomasevich 1975, pp. 171, 210, 256. ↑ Milazzo 1975, p. 64. ↑ Cigar 1995, p. 18. ↑ Karchmar 1987, p. 397. ↑ Pavlowitch 2007, p. 80. ↑ Cigar 1995, p. 19. ↑ Hoare 2006, pp. 143-45. ↑ Hoare 2006, p. 145. 1 2 3 Tomasevich 1975, pp. 256–61. 1 2 Hoare 2006, pp. 146-47. 1 2 3 4 Tomasevich 1975, pp. 258–59. ↑ Hoare 2006, p. 331. ↑ Hoare 2013, p. 355. ↑ Čutura, Vlado. "Rađa se novi život na mučeničkoj krvi". Glas Koncila. Retrieved 30 December 2015. ↑ Vukšić, Tomo. ""Dan ustanka" - ubojstvo župnika iz Drvara i Bosanskog Grahova". Katolički tjednik. Retrieved 30 December 2015. ↑ "Drvar: Ekshumirani ostaci ubijenog župnika Waldemara Maksimilijana Nestora". hrsvijet.net. Retrieved 30 December 2015. 1 2 Ramet 2006, p. 146. ↑ Mennecke 2012, p. 483. ↑ Tomasevich 1975, pp. 259–61. ↑ Tomasevich 1975, p. 260. ↑ Tomasevich 1969, pp. 101–02. 1 2 Tomasevich 2001, p. 228. 1 2 Cohen 1996, p. 48. ↑ Tomasevich 1975, pp. 378–380. ↑ Tomasevich 1975, p. 470. ↑ Tomasevich 1975, p. 391. ↑ Timofejev 2010, p. 87. 1 2 Tomasevich 1975, p. 392. ↑ Tomasevich 1975, p. 393. ↑ Tomasevich 1975, p. 394. ↑ "Foreign News: New Power". Time. 4 December 1944. Retrieved 28 April 2010. ↑ Tomasevich 1975, p. 461. 1 2 Washington Times 14 September 1999. ↑ Popović, Lolić & Latas 1988, p. 7. 1 2 Hockenos 2003, pp. 116–19. ↑ Ramet 2006, pp. 188–89. 1 2 3 4 5 Totten & Bartrop 2008, p. 68. 1 2 Ramet 2006, p. 420. 1 2 Tanner 2001, p. 218. ↑ Cohen 1996, p. 207. ↑ Velikonja 2003, p. 246. ↑ Magaš & Žanić 2001, p. 347. ↑ Bartrop 2012, p. 294. 1 2 3 Cigar 1995, p. 201. ↑ Toal & Dahlman 2011, p. 57. 1 2 Ramet 2006, p. 359. ↑ Bugajski 2002, pp. 415–16. ↑ Ramet 2006, p. 398. ↑ Pavlaković 2005, p. 19. ↑ Thomas 1999, p. 212. 1 2 3 4 Lukic & Lynch 1996, p. 190. 1 2 Ron 2003, p. 48. ↑ Thomas 1999, p. xix. 1 2 Toal & Dahlman 2011, p. 58. ↑ Hoare 2001, p. 182. ↑ Ramet 2006, p. 427. ↑ Velikonja 2003, p. 268. 1 2 3 Bartrop 2012, p. 193. ↑ Goldstein 1999, p. 240. ↑ Thomas 1999, p. 98. ↑ Allen 1996, p. 155. ↑ Ramet 2006, p. 429. ↑ Allen 1996, p. 57. ↑ Judah 2000, p. 170. 1 2 Lukic & Lynch 1996, p. 204. ↑ Engelberg 10 December 1991. ↑ Burns 10 May 1992. ↑ Goldstein 1999, p. 242. ↑ Ramet 2006, p. 428. ↑ Allen 1996, p. 59. ↑ Bugajski 2002, p. 411. ↑ Cigar 1995, p. 193. ↑ Sells 1998, pp. 80, 187. ↑ Hockenos 2003, p. 119. ↑ Bartrop 2012, pp. 270–72. 1 2 3 Bianchini 2010, p. 95. ↑ Jungvirth 14 June 2013. 1 2 Phillips 23 July 2008. ↑ Strauss 29 December 2003. ↑ Bartrop 2012, p. 194. ↑ Ramet 2010a, p. 275. 1 2 3 Ramet & Wagner 2010, p. 27. 1 2 B92 13 May 2006. ↑ Stojanović 2010, pp. 233–234. ↑ HRT 17 May 2005. ↑ B92 13 May 2007. ↑ Bartrop 2012, p. 217. ↑ Bakke 2010, pp. 82–83. 1 2 Höpken 2007, p. 184. 1 2 Stojanović 2010, p. 234. 1 2 Stojanović 2010, pp. 234–236. ↑ Stojanović 2010, pp. 236–237. ↑ Stojanović 2010, pp. 234–235. ↑ Ramet 2008, p. 143. ↑ B92 23 December 2004. ↑ Ćirić 23 December 2004. ↑ Ramet 2010b, p. 299. ↑ Blic 15 December 2009. ↑ Dalje 29 September 2012. ↑ ESPN 13 November 2004. ↑ Dnevnik 27 August 2010. ↑ Dnevnik 22 January 2007. ↑ B92 11 June 2003. ↑ BBC 19 May 2003. ↑ BBC 20 June 2003. ↑ B92 4 July 2003. ↑ B92 7 July 2003. ↑ BBC 7 July 2003. ↑ Vijesti 13 August 2011. ↑ Hoare 2007, p. 355. ↑ Jeffrey 2006, pp. 206, 211. ↑ Jeffrey 2006, p. 219. ↑ Jeffrey 2006, p. 222. 1 2 3 Pećanin 2 August 2002. ↑ U.S. Department of State 4 March 2002. ↑ Kebo 1 May 2005. ↑ Slobodna Dalamacija 13 July 2009. ↑ Index 13 July 2009. ↑ B92 13 July 2009. ↑ 24 sata 7 August 2009. ↑ 24 sata 24 February 2010. ↑ B92 17 May 2005. ↑ Ristic 6 March 2014. ↑ "Ukraine Crisis: Serb Chetniks Claim Killings of 23 Ukrainian Soldiers". Retrieved 16 September 2016. Bakke, Elisabeth (2010). "Party Systems Since 1989". In Ramet, Sabrina P. Central and Southeast European Politics Since 1989. Cambridge: Cambridge University Press. pp. 64–90. ISBN 978-1-139-48750-4. Bianchini, Stefano (2010). "The EU in the Values and Expectations of Serbia". In Listhaug, Ola; Ramet, Sabrina P.; Dulić, Dragana. Civic and Uncivic Values: Serbia in the Post-Milošević Era. Budapest: Central European University Press. pp. 221–240. ISBN 978-963-9776-98-2. Hoare, Marko Attila (2001). "Civilian-Military Relations in Bosnia-Herzegovina 1992–1995". In Magaš, Branka; Žanić, Ivo. The War in Croatia and Bosnia-Herzegovina 1991–1995. London: Frank Cass. pp. 178–199. ISBN 978-0-7146-8201-3. Höpken, Wolfgang (2007). "Between Civic Identity and Nationalism: History Textbooks in East-Central and Southeastern Europe". In Ramet, Sabrina P.; Matić, Davorka. Democratic Transition in Croatia: Value Transformation, Education, and Media. College Station: Texas A&M University Press. pp. 163–192. ISBN 978-1-60344-452-1. Mennecke, Martin (2012). "Genocidal Violence in the Former Yugoslavia". In Totten, Samuel; Parsons, William S. Centuries of Genocide: Essays and Eyewitness Accounts. New York: Routledge. ISBN 978-0-415-87191-4. Pavlaković, Vjeran (2005). "Serbia Transformed?". In Ramet, Sabrina P. Serbia since 1989: Politics and Society under Milopevic and After. Seattle: University of Washington Press. ISBN 978-0-295-80207-7. Ramet, Sabrina P. (2010a). "Politics in Croatia Since 1990". In Ramet, Sabrina P. Central and Southeast European Politics Since 1989. Cambridge: Cambridge University Press. pp. 258–285. ISBN 978-1-139-48750-4. Ramet, Sabrina P. (2010b). "Serbia and Montenegro Since 1989". In Ramet, Sabrina P. Central and Southeast European Politics Since 1989. Cambridge: Cambridge University Press. pp. 286–310. ISBN 978-1-139-48750-4. Ramet, Sabrina P.; Wagner, Peter F. (2010). "Post-socialist Models of Rule in Cental and Southeast Europe". In Ramet, Sabrina P. Central and Southeast European Politics Since 1989. Cambridge: Cambridge University Press. pp. 9–36. ISBN 978-1-139-48750-4. Stojanović, Dubravka (2010). "Value Changes in the Interpretations of History in Serbia". In Listhaug, Ola; Ramet, Sabrina P.; Dulić, Dragana. Civic and Uncivic Values: Serbia in the Post-Milošević Era. Budapest: Central European University Press. pp. 221–240. ISBN 978-963-9776-98-2. Tomasevich, Jozo (1969). "Yugoslavia During the Second World War". In Vucinich, Wayne S. Contemporary Yugoslavia: Twenty Years of Socialist Experiment. Berkeley: University of California Press. pp. 59–118. OCLC 652337606. "Chetniks rehabilitated". B92. 17 May 2005. "Controversial group in Srebrenica incident". B92. 13 July 2009. Horvat, Karmen (13 July 2009). "Chetniks Urinate on Bosnia-Herzegovina Flag". Dalje. "Sensagent Dictionary". Sensagent.com. 2011. Retrieved 3 December 2011.